A war memorial in New York has been vandalised by PewDiePie fans with the words 'subscribe to PewDiePie'. The graffiti was spotted and shared to Reddit by user Gato1980. The message was scrawled multiple times across the huge memorial in Cadman Park, Brooklyn. 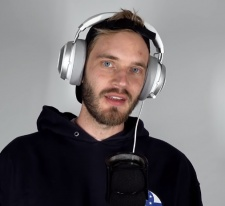 Over the past few months, Felix 'PewDiePie' Kjellberg has been embroiled in a feud with T-Series, an Indian YouTube channel set to dethrone him as the most subscribed channel. As of writing, Kjellberg and T-Series are both sat on over 88.8 million subscribers each. There's an 11,000 subscriber gap between the two channels. Fans and supporters of Kjellberg have gone to extraordinary lengths to keep the creator on top. While some of the efforts have been light-hearted (including a billboard in Times Square and hacking printers to print 'sub to PewDiePie') vandalising a war memorial may be a step in the wrong direction. Kjellberg has not commented on the graffiti, nor has he encouraged his fans to deface public property for his cause. Last year, the YouTuber took advantage of the battle to launch a fundraiser for underprivileged children in India. He raised £173,682 for the CRY organisation.